Sometimes things go well. Sometimes they do not. When you try a DIY or something from a blog or Pinterest you hope, you cross your fingers, you throw caution to the wind and think … it TOTALLY seems like it would work. Why wouldn’t it? And then it doesn’t. You throw out $25 worth of ingredients or materials and every bit of your hope, confidence and faith in making a pair of wedding worthy chandelier earrings out of bowtie macaroni, goes right down the drain. And garburator. Do not be alarmed. It’s not you. It’s them. O.K., sometimes it’s you. It’s happened to me too though. In fact there’s an entire website dedicated just to Pinterest fails. Sometimes if you click on it you’ll even see people who have tried my DIYS and failed. The thing with blogs is, all it takes is a good photo and even the most horrendous craft can look kind of appealing. But not every single DIY on the Internet is a big, fat, fail waiting to happen. This month I gave two a shot and BOTH of them turned out perfectly including the monogrammed mug at the top of this post. Today’s post is dedicated to two blog DIYS that actually worked. 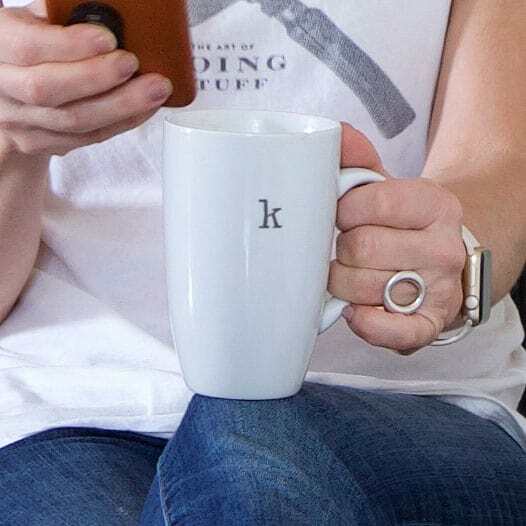 A few years ago there were a lot of Pins about how you can draw on any mug with a Sharpie, bake it in the oven and VOILA, your design is permanently stuck on the mug. Or dish, or bowl or baby or whatever it is you want to draw your design on permanently. I had a hunch this one wasn’t going to work so I did a bit of research and discovered it would only work with OIL based Sharpies. Not the regular sort of Sharpies you can pick up at the corner store. I searched everywhere and couldn’t find these supposedly easy to find oil based Sharpie Paint pens anywhere normal like Walmart, Target or Staples, so I gave up. If you’re in The United States you can find these paint pens easily on Amazon, and they’re cheap. If you’re in Canada you can find these paint pens easily on Amazon, where they aren’t quite as cheap. I don’t now if I didn’t check Amazon at the time or I just decided if I couldn’t find them at a store where I could also buy some ground beef and a tricycle then I wasn’t going to buy them. A few weeks ago I was rummaging through my basement and came across a stash of mugs from the Dollar Store I had bought way back when I thought I’d try this technique when the Pin first became popular. I brought them upstairs, washed them and started my research again. Seems a lot of people have tried a bunch of different ways to make this technique work, with not a lot of success. Except one woman. Jen. Jen did a post on writing on mugs with a Sharpie one year ago repeating all the problems I was having or could foresee. And then she figured it out. You can read her full tutorial here. Now that I know this works I’ll be expanding my Sharpie/Mug repertoire. Click here to see exactly how Jen made this technique work. It’s easy. It all has to do with timing and oven temperature. Then there’s Amanda from Our Humble Abode. 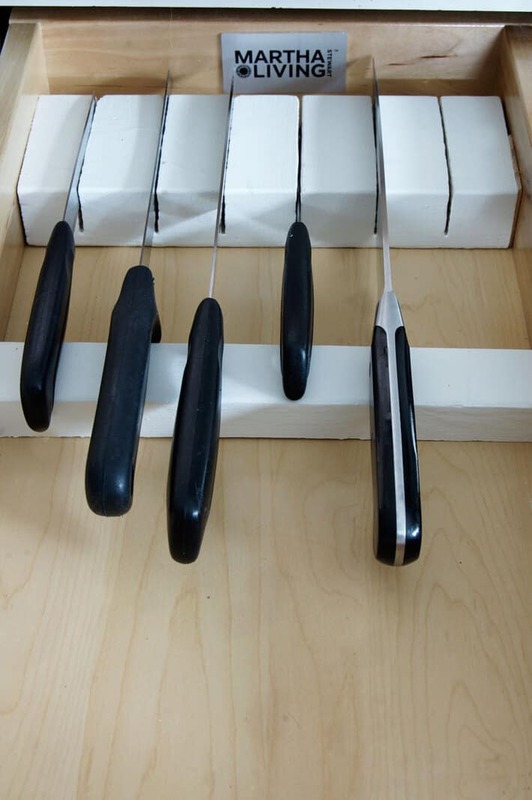 I came across her post on making a knife block for a drawer. She said she didn’t know what took her so long to do it. It’s an easy DIY. HEY! I didn’t know what was taking me so long to do it! I needed a knife block in my drawer! So the second I came across her post I started making a knife block. And it worked. You can read her full tutorial here. The big mistake I made was assuming this wasn’t going to work. I do this sort of thing all the time. Don’t put enough time or energy into something just assuming it won’t work and then holy crap, it works, and I wish I’d used better materials or took more time with the project. I had a block of maple I could have used but I didn’t want to use it in case this didn’t work out. And now that I’ve done it (using an old spruce 2X4) it’ll be another decade before I muster up the bother to make another, better one. And by then something better than knives will maybe be invented. Or a 3-D meat printer that prints out already cut meat. So yeah, the Internet is a big, fat liar. Just not always. These two DIYS from other blogs I tried both worked, were easy and actually practical. That’s the holy trinity of the blog world. And if I get the angle and lighting just right I’m sure I’d be able to turn either one of these projects into a pair of Pinterest worthy chandelier earrings. All it takes is one good photo. Instagram though? Now that’s a fun place. Follow me on Instagram please. Single men leave their carts in the middle of the aisle to try to get women to talk to them. Married men do it because as soon as they get married, they forget where everything is, and they’re too distracted looking for the damn chamomile tea she likes to remember to pull it over. LOL. O.K., then, got it. ~ karen! I sometimes do it because I love to take my 2YO daughter grocery shopping with me. She’s an excellent “helper”. Hi Dagmar. I have no idea, but I doubt it. The only way to know is to try. 🙂 ~ karen! I made those mugs as a Christmas gift for friends in 2014 and, suffice it to say, it is not dishwasher safe. I did warn them not to do that but…..
I’m losing sleep because of your blog. But please keep it up!! I’ve washed this mug in the dishwasher (top rack) about 10 times now and it’s still perfect. No fading, no erasing. 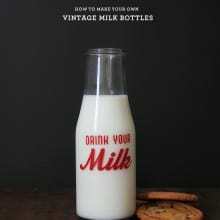 This technique definitely works so give it a shot again using these instructions. 🙂 ~ karen! Karen, have you put yours in the dishwasher or microwave? Yes to both. And now that I think about it I probably shouldn’t have put it in the microwave because the paint is metallic, lol. But I guess it isn’t metallic enough to cause sparking in the microwave or I would have noticed. And I’ve washed it in the top rack of the dishwasher about 10 times and it’s still perfect. ~ karen! Ha! I thought of doing the cleaver, but also have a thing for monograms. Now that I know it works I’ll be doing about 8 million more of them so I’m sure a cleaver will come up. 🙂 ~ karen! oven cleaner, chlorine bleach and limeaway. You forgot windex. I could probably clean the whole house with enough time and Windex. Homemade stuff kinda works, but not as fast or as well. Fantastic when things work out like they should. I’ll keep the mug idea for when I might need something like that. It’s kinda cute! The knife block is TOTALLY going in my Micro Home though!! Hey, you should come live in my country. A heaven of equality -women leave their carts everywhere too! Bookmarked the one on mugs as I have every “good” intention of getting to that someday! 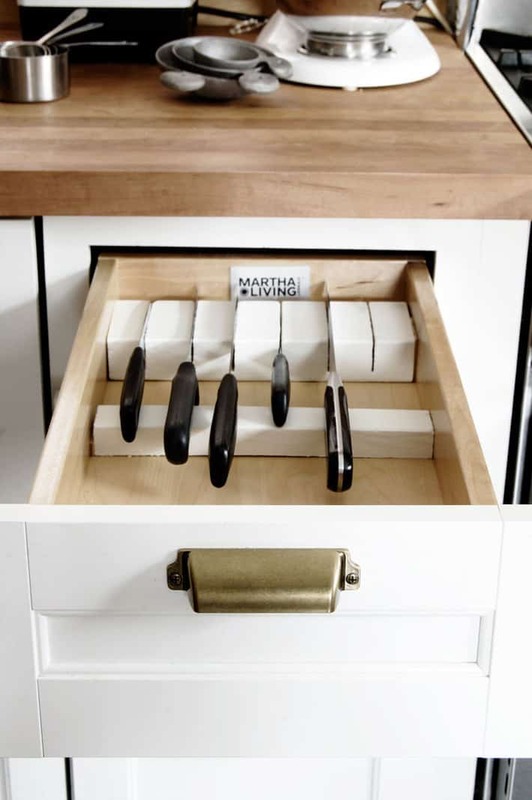 Don’t have an extra drawer to dedicate to knives but it seems a great idea if you do. As for men and grocery carts, I’ve noticed since forever that *most* men don’t have the same spacial sensitivity as women. They’re just not aware that they’re in the way as they don’t have that “feel” for their personal space or space they’re using that *most* women do. Like, when I try to cook or do anything in a fairly small kitchen with the DH, he’s in the way at every step. But in my experience usually a woman instinctively knows when she is, or even is going to be, in your path and moves accordingly. And if she misses she’ll smile & say sorry! This is one of the many reasons why we are better drivers! 😀 I think the space-aware instinct evolved as a protective mechanism, less needed by those less often carrying a baby in their arms. But I’ve worked in restaurant kitchens where men definitely had come to be aware of what or who was where; collision with someone carrying a multi-gallon pot of boiling whatever will do that for ya! And to be fair to DH, he really is a VERY good driver; a small child who darted out in the street lives because of it. Somehow, I never assume your DIY tutorials will fail. You put enough thought into them and give exact directions and never try at home brain surgery so your stuff is very reliable. Pinterest on the other hand is heavy into the “chalk/blackboard paint will fix anything” mode. It makes me crazy sometimes when somebody says “Pin now, read later or you will be sorry” like there’s no other search engine or blogger on the planet doing exactly the same thing. I like Pinterest for the eye candy though. Nice pretty pictures. I made the cat scratching pad out of cardboard on your blog which was linked from your blog to another website and it turned out fine. PS–I cannot comment on your posts on FB. Are comments turned off? Is there a tute for that? PPS–I tried the mug one and it does work if you use the oil sharpies and follow the instructions exactly. Hi Maria – If you’re seeing my posts on FAcebook, you should be able to comment on them. I know Facebook can get a little glitchy sometimes though and it could just be that. Try again in a day or two to see if it’s fixed itself. ~ karen! 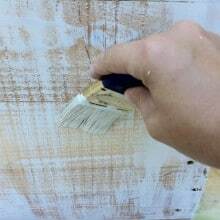 As are all your DIY posts, these are a couple of great ideas. I’d like to add that any good art supply store should carrie Sharpie paint pens. I get mine at De Serres. Pebeo also has a line of paint called Porcelaine 150, including pens, in a zillion colors, including irridescent, that uses far less energy than when baking than the Sharpie. Pebeo says… FOR DISHWASHER-SAFE USE: 35 minutes at 150°C (300°F), in a domestic oven (at a stable temperature), after drying for a minimum of 24 hours.” I’ve used this paint with great success though, frankly, wouldn’t risk putting it in the dishwasher. Most art supply stores also carry Pebeo products. And, no, I’m not a rep for the company! Just an experienced DIYer. I’ve tried the Porcelaine pens inside and outside mugs and bowls. They are dishwasher and oven safe but not fork and knife safe. Karen, can you test the sharpie for scratch safe? I think generally with something like an oil based product (these sharpie paint pens etc) I wouldn’t put them anywhere that it’s anything but decorative. So in other words, not on any eating surface that you’d be scratching with a knife or fork and not on the inside of a mug. ~ karen! Can we talk about that ring?! I also leave my cart to run down ailses, but thats just cause I don’t want my toddler to see something then proceed to ask for it 287 times in 10 minutes. I also have ADHD and go through the grocery store like I have tourettes. I love mugs too, I have a collection of eclectic pottery mugs, and I have a favourite drink for each one. I can’t wait for you to show us your re-finished floors. It’s a project I’ve been putting off , and now i’m waiting for you to tell me exactly how to do it. You may be waiting a while Sally, lol. I’ve hit a roadblock. Or a floorblock. But I’ll keep trying. ~ karen! I’m far from being a perfect man, but at least I’ve outgrown the Neanderthal gene responsible for making men want to park a shopping cart smack dab in the middle of an aisle at the grocery store. Right this very moment, in a small, windowless room adorned with 1970’s fake wall paneling and one over-sized steel desk the size of a Mini Cooper, a tireless government researcher–fueled by bad coffee and good grant-funding, is attempting to determine the precise, explanatory correlation between men and their seemingly innate need to position shopping carts (termed “bascarts” by government researchers) at center-position of grocery store aisles. We can only hope that golden research finding is released soon…most likely as a “late-breaking news” item that interrupts a favorite television show. That watch profile!!! !……what is it? I need it. Apple watch. 🙂 ~ karen! Oh…Your hands look so lovely au naturale….I have no idea how to spell but onward with my opining. I am too darn old to dedicate any moments of time or inhalations of breath or pumps of my ancient heart muscle to acquisition of stuff no matter how impressive or intriguing. I am your student who tries endlessly-with minimal success to rid myself of “STUFF”. Getting this Stuff was as yummy as all the Chocolate my sugar addiction has placed in awful attachment to my hips etc. I need one of those houses with vast stark expanses containing only wildly attractive furniture that is like all of my myriad knick knacks,meant to look good..totally useless. I don’t understand why I wasn’t born just like you. How come you got looks and talent and efficiency and I got Knick Knacks? Why Karen? Why? Sob……………. So I love other posters tips too..like the Pebeos at Omer De Serres..I was there yeserday for oils.Didn’t know about the variety she mentioned..thanks! Hachem is another good art store..and Curry’s online. Don’t get me started on Amazon.com and .ca re prices.Our dollar blablabla is not helping..Can you fix that? Could you make a knife block out of those solid foam blocks used for packing cameras and other delicate items? And–not only do men leave their carts blocking the aisle while they shop, they leave them there while chatting, AND don’t apologise and feel guilty (as any decent woman would) when they spot someone trying to manhandle their cart out of the way! Men leave their carts in the middle of aisles because they’re freeeeeeeeeeeee! to do what they want, any old time ( like the song goes). Living where I do in the Caribé, I never have all the materials and tools to execute the perfect DIY, so necessity IS the mother of invention. If I want to tackle a project right away I have to go a’hunting for the perfect substitutes. If they’re seasonal projects, I organize them all into files and list materials needed and order in bulk on Amazon U.S. and wait 2 weeks for the stuff to arrive via my shipping box. I usually have left over material for future DIYs. The key is to accept from the very start that your creation is not going to be exactly like the pic provided, but if you’re into it enough and just know it’s going to be fab, it will be. Just make it your own, and to say honestly I’ve never really failed a Pinterest project because I choose them so carefully. The mugs could be great Easter egg nest favours for Easter brunch as personalized table seating markers that my guests can take home. Great stuff! Your knife drawer made me angry. I’m just so jealous that you have an entire empty drawer to use for knives. If only I had an empty draw in my kitchen. I love my gadgets – ravioli cutter, handy little tool that cuts the centres out of cupcakes, ice cream scoops in a variety of sizes (can’t have too many of those, three knife sharpeners and two steels — just to name a few. I received a very nice magnetic wall mount knife holder for Christmas (which I asked for). Love, love, love it. Wanted to thank you for two posts. 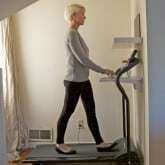 I ordered the treadmill and use it daily. I also got the knife sharpener and that device has saved knives I would have otherwise thrown out. Hey, the mug is adorable!. Thanks bunches! There is a line of grocery stores in Northeast Ohio called “Marc’s”. The everything in these stores is cheaper than elsewhere, mostly. They are primarily grocery stores, with junk. Their aisles are just a bit narrower than most grocery stores, and thoughtless shoppers, MOSTLY WOMEN, are a real pain you know where! As I am also a woman, this is not a gender bashing statement, just a fact! Some days, one just would like to stand in an aisle and just scream, but no, one resists. Just sayin’ that aisle hogs come in both genders. Also, I have some of the oil based markers, and will be trying out the coffee mug thing! Thanks Karen! Ok, so men aren’t the only gender to leave grocery carts in the middle of the aisles at the store. I have a very VERY bad habit of doing that. I don’t do it because I’m rude. I just get so distracted by all of the pretty packaging and all. I even walk away and leave my purse sitting in the cart. Second, would the oil-based Sharpies work for your homemade salad dressing markers? Probably can’t put the bottle in the oven, though. Just wondering. Hi Debbe – I do use the black oil basked Sharpie for my salad dressing markers! But they’ll still wipe off if you let too much oil drip down the side and wipe at them. So you still have to be a bit careful but they’re the best things I’ve tried by far to date. I think you actually could put the glass bottles in the oven as long as you put them in and THEN turn the oven on so they raise up to temperature gradually. Also I wouldn’t want to bake them at a very high temperature. Low and slow for a longer period of time. If I remember I’ll do an experiment and let you know. ~ karen! There’s that gorgeous ring again! Did you use the Bling Wipes that are “an absolute must!” for the mug? on amazon.ca they’re $62.05, but on amazon.com $12 with free shipping over $35…so, let me get this right. For amazon.com buy 3 for $36 ($50.48cad), and get free shipping. I ask again, did you use the Bling Wipes????? No, lol. She doesn’t actually say to use the Bling Wipes for cleaning the mug. The Bling Wipes are part of her post which is making a little present for a newly engaged woman. She stuffs the mug with a little packet of coffee, a ribbon and a packet of “Bling Wipes” which are for cleaning diamonds. In this case the new engagement ring. ~ karen! While I do think that your knife drawer is a thing of beauty, mine has waaay too many knives to use that method. Cue commercial for Lee Valley’s knife guards which are the greatest thing since sliced bread. They protect one’s searching fingers and the blades from damage and allow for a plethora of stuff in said drawer. I’m so glad I got to use the word plethora. As to men leaving their shopping carts mid-aisle, the worst offenders cartwise are not gender specific but Costco specific. Gawd, they’re all idiots, well mostly, especially the entitled weekend shoppers! Don’t get me started. Oooops, too late. The best one yet, actually happened in the parking lot, when a guy with a loaded cart couldn’t find his car and went down the wrong row so he “parked” his cart in a spot, found his car then drove over to his cart. I was laughing so hard, tears squirt from my eyes! I will not be trying this DIY – but I appreciate that you took the time to see if they would work! However, HAVE to know – where did you get that silver circle ring??? LOVE IT!!! The size, the shape…and especially that initial. Men have NO cart etiquette in any way, shape or form. I drive the cart when shopping anywhere with my husband. Costco is the worst. He will randomly walk away from the cart, middle of the aisle, mind boggled by the bulk buying possibilities. It’s awful. Did you use a stencil for your “k”? I love the typewriter font. Hi Kathleen! I actually just hand drew the “K’. 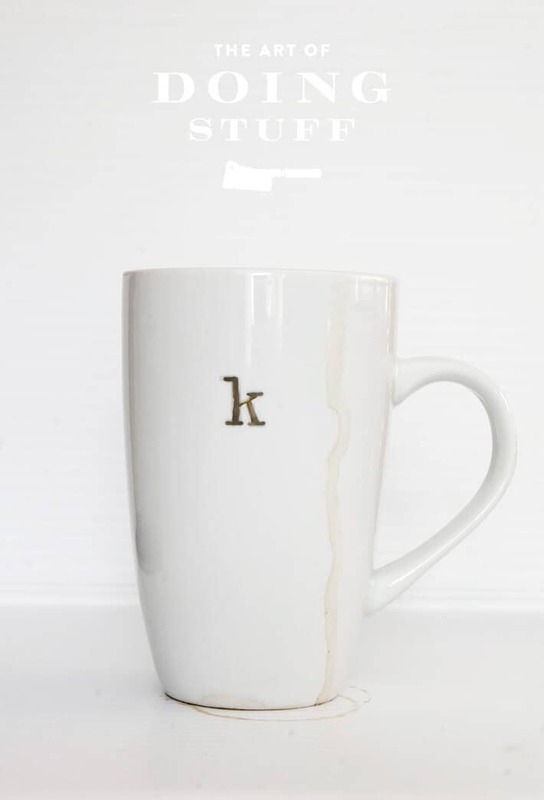 I used google images and searched “k” and just found a font I liked and drew it on the cup. If you make a mistake it’s easy to just wipe it off with nail polish remover. 🙂 ~ karen! 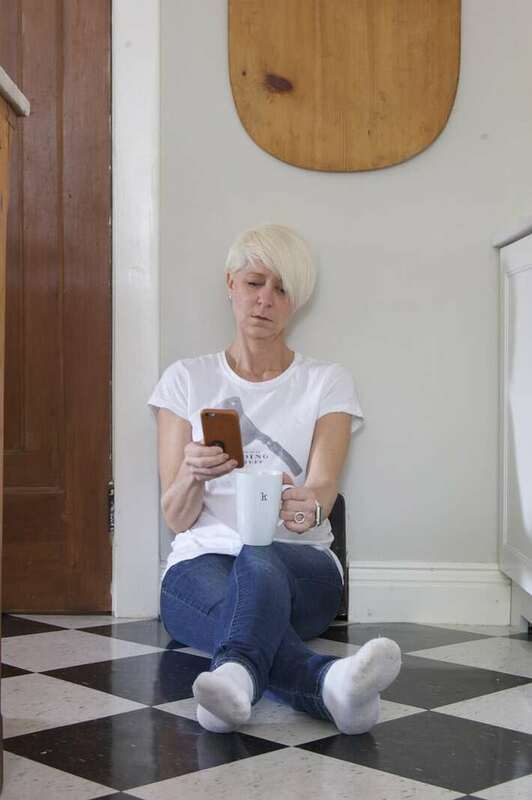 You are better off with the spruce, Esteemed DIY Lady Blogger Karen. Although maple is a relatively soft hardwood, it will still dull your blades faster than a true softwood, of which spruce is a fine example. So your actual choice of materials is yet another instance in which your posse of guardian angels was on the job. You may regret the snaggly cuts you had to photograph for the story, but that’s all !